Written on May 18, 2006 by Kevin. My wife and I stepped foot into the god forsaken Walmart the other day which brought us upon a bin full of $1 movies. I've seen these types of bins before and generally speaking, they have nothing that my wife or I care for. This time was different however. They had a collection of old cartoons on DVD. 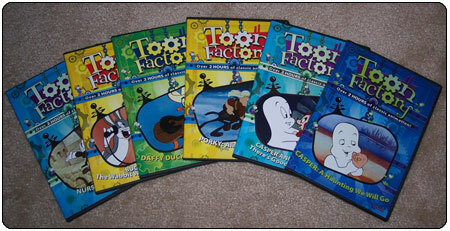 The DVDs were each labeled Toon Factory and had different character cartoons such as Bugs Bunny, Casper and even includes a nursery rhymes collection. These are the cartoons from years back now placed onto DVDs. Its brilliant. My wife and I thought this would be a nice addition to our collection of movies that we think Rylan may find interesting. Each DVD contains around 2 hours of cartoons. 2 hours of cartoons for $1? You have got to be kidding me. We visited other Walmarts hoping to find additional DVDs but had no luck finding any DVDs that came close to this. It appears that they are not selling them at each Walmart store. I am certainly glad we snagged these up when we had the chance. Hey Kevin, Those old cartoons are just as entertaining as ever. Imagine you and Rylan, feet up on coffee table, big bowl of popcorn watching Casper! What a great chance to have some quality time. I remember when my son pointed out how he could tell the difference between "old" cartoons and newer ones, but that some of the older ones were better. Great find! People up here hate WalMart, but not me. This was the idea behind these cartoons and the other movies that we purchase these days. Just another chance to spend some time with Rylan enjoying something together. Many things recently have been purchased for Rylan with this in mind. Games and movies that my wife or I grew up with that we would like to share with Rylan. How do you feel about the "baby channel" thing? Have you heard about it? The difference I see is that you and your wife may not want to sit and watch it. At least ALL of you may want to watch reruns of Popeye (still one of my favorites). Hey Kevin, have you seen this site? You might like the climbing ottoman things. Thanks for the link Phil. Great find.